hi guys , im back on forum again. 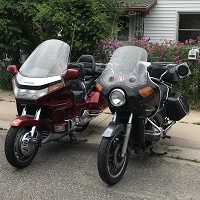 i have a 84 goldwing 1200a i have been putting back togther anyway bikes runs ok rebuilt carbs and tune up im having a problem with cly#3 1 2 4 ok with the bike is running and u slowly pull wires there is no change in #3 at idle ur at higher rpms, poss carb problem pls advise. spark is good plugs new. 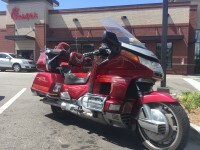 Before you start surgery, since the bike is running try a double-dose of SeaFoam in the fuel. It doesn't work immediately, you will probably have to go thru 3-4 tanks of SeaFoam fuel to notice the difference. The fuel passes through carb #3 to get to carb #1. I had a problem with carb #1 and I took both right side carbs off several times to clean and adjust. However, it would run well for a short time and then it would start skipping. After the third time I thought that it must be the float valves. I checked on ebay and found someone with OEM float valves and bought two of them. I changed both right side float valves and the problem went away. So if you are not having trouble with carb #1 then the fuel is passing through and should be filling carb #3 as well, but evidently is passing by a stuck #3 float valve. I would think that the float valve in carb #3 must be sticking closed. Loosen the drain screw on the #3 float bowl and see it you have fuel in it. If no fuel runs out then get some new float valves. And be sure of the float level adjustment.